“I can’t light, no more of your darkness. 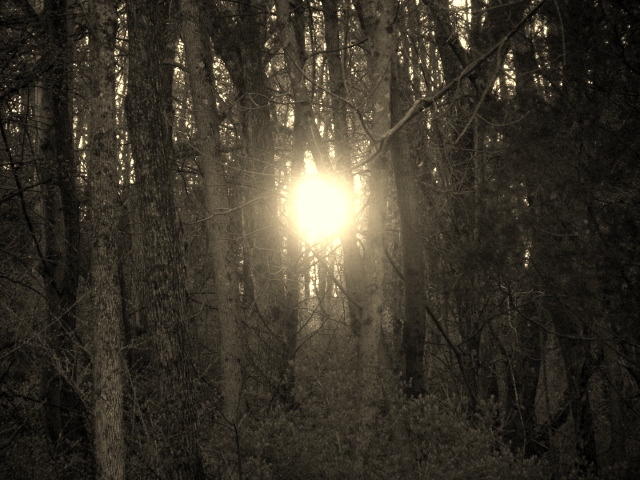 In the photo above, although the sun is behind the trees, it appears to be in front of the trees. 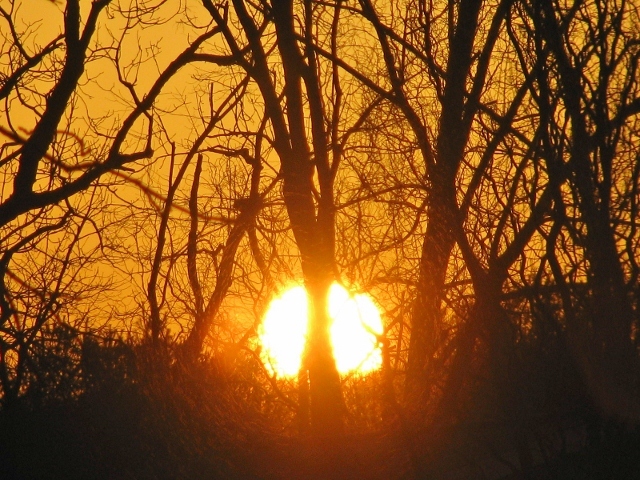 However, in the photo below, again, the sun is behind the trees, but you can see the trees in front of the sun. Why? What causes this phenomenon? Time of day? Distance between the trees and the camera? Background being dark in the first photo and lighter in the second? Any thoughts? And because Sir Elton John said, “All my pictures, seem to fade to black and white”…so did mine fade…to sepia. Would love to hear any comments that you have about the phenomenon of the sun and the trees in the photos. Or about the color vs. sepia pictures. Or about a new recipe that you tried. Or a new outfit. Or Elton John. Or anything you want to comment about. Have a bright, sunshiny day! Thanks for stopping by and for the link. Merci! Glad you could visit and thank you for the link. Merci! Glad you stopped by. Thanks for the link. Merci! Love your sun photos so much that I will be linking to them in my entry! Thanks so much for stopping by, commenting, and linking. I have to learn how to pingback or link or whatever it’s called. Going to search that now. Cheers and Merci! Glad you liked the sun photos. Thanks for the link. Merci! Thanks for linking to my sun photos. Merci! Thanks for stopping by and commenting. I didn’t notice the effect while I was shooting, so it was a nice surprise when I was going through the pictures on the computer and noticed it. Merci! Thanks. Glad you enjoyed them. Happy weekend to you, too! Merci! 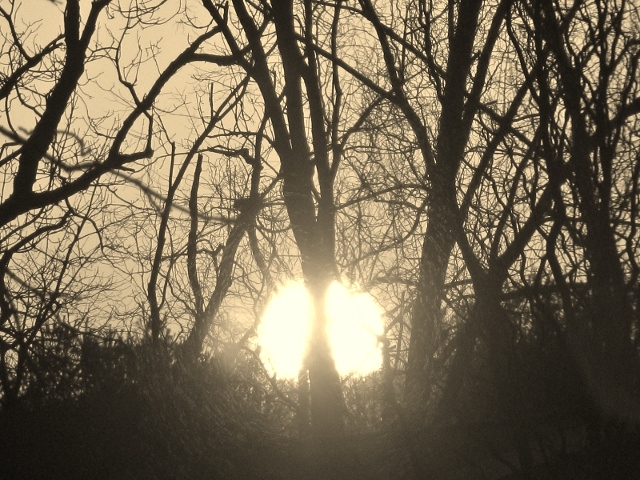 It’s due to refraction: dependent on the light, it appears to come from a source that refracts it, in this case the branches of the trees 🙂 and that depends on the angle the sun rays hit the trees, angle, ambient air etc… #physics! Thank you so much for the information. I thought there might be a science behind it, just wasn’t sure which science it was. And, although I find the things that happen as a result of physics, like this, very interesting, solving physics problems was probably my least favorite subject in school. The right side of my brain simply enjoys the phenomenon in the photo, but the left side of my brain is still interested in learning how it works. Not interested enough to do the math to figure out the angles of refraction, etc., just enough to know the theory behind it. The left side of my brain is satisfied now. Merci! I love the way the sun appears in front of the trees in the first photo. I prefer the colour ones because I love the warmth of the sun, which is lost in black and white. By the way, Elton John is a favorite, such great lyrics. Thank you for stopping by and commenting. I changed the photos to black and white, but then switched to sepia tone. They appear black and white, but if you look closely, you can see a very slight tan color around the sun. Like black and white with the tiniest bit of warmth. I have to agree, though. I do love the warmth of the sun, figuratively and literally. Merci! Thanks for linking to my post. Glad you liked it. Merci! Thanks for the link. Glad you liked it. Merci! The first of the series… has absolutely stolen my heart… love the pic!! That’s my favorite, too. I like the bright, warm sun and the dark, cool woods. Thanks so much for visiting and for your comments. Merci bien! Thanks so much for stopping by, viewing my photos, and leaving a comment. Another reader told me it had to do with light refraction, angles, and physics. Enjoy your day! Merci! Beautiful! Each photo brings us to a place where light and joy exist everyday. Thanks. Thanks for stopping by and taking the time to comment. Merci! Great pst–I enjoyed the integration of photos and your words.